No. 26, Jalan TPK 2/6, Taman Perindustrian Kinrara, 47100 Puchong, Selangor, Malaysia. Ganey Marketing Sdn Bhd founded in 2010. More than 15 years of experience in Single Screw Air Compressor & Water Lubrication Oil Free Air compressor in Malaysia, handling few hundred of single screw air compressor customers throughout Malaysia, that is Ganey Marketing Sdn Bhd. We are the Exclusive Sole Agent and Distributor in Malaysia for Ganey Screw Air Compressor, a leading brand and international premium class quality from Guangdong Ganey Precision Machinery Co.,Ltd of Midea Group, China. We supply of complete range of Ganey Single Screw Air Compressor and solution systems in Malaysia market to a wide range of industries. 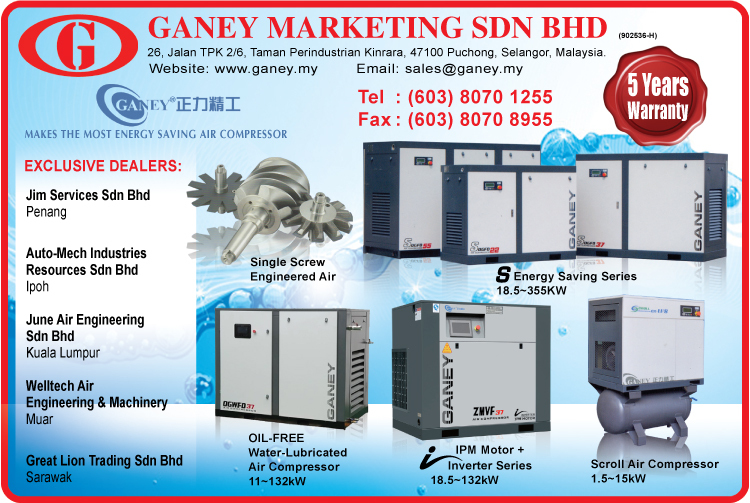 Ganey marketing Sdn Bhd is present in the industrial markets of whole Malaysia. Our sales network ensures the quality of service throughout the area all around the country. We are an organization committed to presenting the market place with high quality innovative equipments and products. Based on the know-how gained from our customers in many industries we will find the most suitable, low-cost solutions for your new and special needs. That is the reason why we are the driving force in Malaysia air compressor industry. All maintenance and repairs are carried out by our factory-trained engineers and technicians, tailored maintenance packages can be put in place for large installations of compressed air equipment, thus keeping service costs minimized by eliminating unnecessary service visits, all equipment serviced according to manufacturer specification and standard.